1. In medium saucepot, heat 1-inch water to boiling over medium-high heat; reduce heat to low to maintain a simmer. In medium heat-safe bowl that fits just inside or slightly above saucepot (bottom of bowl should not touch water), add yolks, sugar and salt. With hand mixer on medium speed or whisk, beat egg mixture 2 to 3 minutes or until pale yellow and frothy. Place bowl in saucepot over simmering water; holding bowl with kitchen towel, add wine and beat 8 minutes or until mixture becomes thick and holds a ribbon when beaters are lifted. Remove bowl from heat occasionally to prevent yolk mixture from curdling. Makes about 6 cups. 2.Into 6 martini or parfait glasses, evenly divide berries. 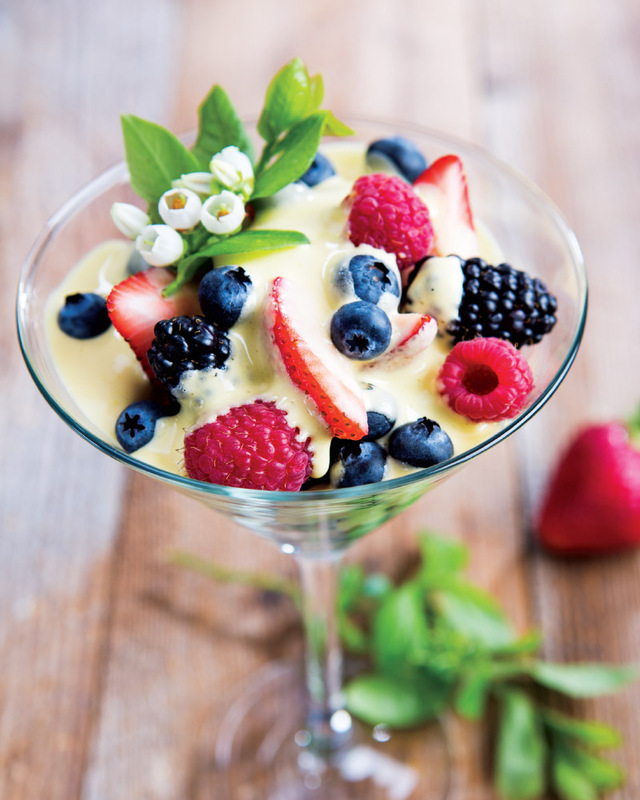 Spoon warm zabaglione into glasses over berries; garnish with mint leaves, if desired. To serve chilled, after removing bowl from heat, beat zabaglione mixture 5 minutes longer or until cooled to room temperature; fold in 1/2 cup heavy cream that has been whipped to soft peaks and refrigerate up to 6 hours. > Fresh, in season berries are high in antioxidants, helping to fight off stess and free radicals.